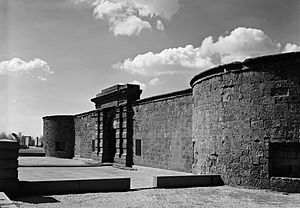 Castle Clinton or Fort Clinton, once known as Castle Garden, is a circular sandstone fort now located in Battery Park, in Manhattan, New York City. 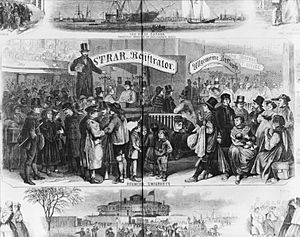 It is perhaps best remembered as America's first immigration station (predating Ellis Island), where more than 8 million people arrived in the U.S. from 1855 to 1890. Over its active life, it has also functioned as a beer garden, exhibition hall, theater, public aquarium, and currently is a national monument. As with all historic areas administered by the National Park Service, Castle Clinton National Monument was listed on the National Register of Historic Places (October 15, 1966). In 1850, the castle was the site of two concerts given for charity by the Swedish soprano Jenny Lind to initiate her American tour. A year later, European dancing star Lola Montez performed her notorious "tarantula dance" in Castle Garden. In 1853–54, Louis-Antoine Jullien, the eccentric French conductor and composer of light music, gave dozens of very successful concerts mixing classical and light music. 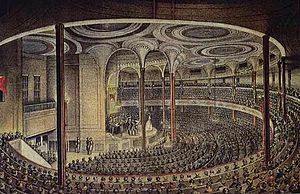 The Max Maretzek Italian Opera Company notably staged the New York premieres of Gaetano Donizetti's Marino Faliero on June 17, 1851, and Giuseppe Verdi's Luisa Miller on July 20, 1854 at Castle Garden. 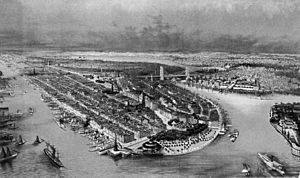 In the first half of the 19th century, most immigrants arriving in New York City landed at docks on the east side of the tip of Manhattan, around South Street. 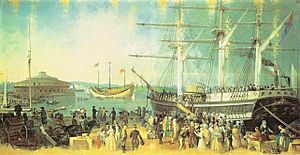 On August 1, 1855, Castle Clinton became the Emigrant Landing Depot, functioning as the New York State immigrant processing center (the nation's first such entity). It was operated by the state until April 18, 1890, when the U. S. government assumed control of immigration processing, soon moving the center to the larger, more isolated Ellis Island facility on January 2, 1892. The new facility was needed because immigrants were known to carry diseases, which led to epidemics of cholera and smallpox. After many unnecessary deaths, and scandals over immigration workers cheating and stealing from immigrants, the immigration center was moved to Ellis Island. Most of Castle Clinton's immigrant passenger records were destroyed in a fire that consumed the first structures on Ellis Island on 15 June 1897, but it is generally accepted that over 8 million immigrants (and perhaps as many as 12 million) were processed during its operation. 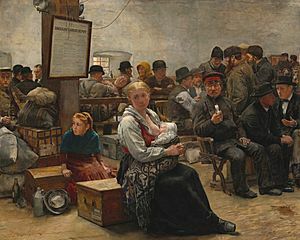 Called Kesselgarten by Yiddish-speaking Eastern European Jews, a Kesselgarten became a generic term for any situation that was noisy, confusing or chaotic, or where a "babel" of languages was spoken (a reference to the multitude of languages heard spoken by the immigrants from many countries at the site). Prominent persons associated with the administration of the immigrant station included Gulian Crommelin Verplanck, Friedrich Kapp, and John Alexander Kennedy. 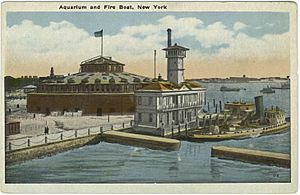 From 1896 to 1941, Castle Garden was the site of the New York City Aquarium. For many years, it was the city's most popular attraction, drawing hundreds of thousands of visitors each year. The structure was extensively altered, and roofed over to a height of several stories, though the original masonry fort remained. In 1941, the politically powerful Park Commissioner Robert Moses wanted to tear the structure down completely, claiming that this was necessary to build a crossing from the Battery to Brooklyn. The public outcry at the loss of a popular recreation site and landmark stymied his effort at demolition, but the aquarium was closed, and not replaced until Moses opened a new facility on Coney Island in 1957. See Brooklyn-Battery bridge. Due to the efforts of Albert S. Bard and other civic reformers, the Castle was saved, and finally became a national monument. Although Castle Garden was designated a national monument on August 12, 1946, the law did not take effect until July 18, 1950, when the legislature and the governor of New York (Thomas Dewey) formally ceded ownership of the property to the federal government. A major rehabilitation took place in the 1970s. It is currently administered by the National Park Service, and is a departure point for visitors to the Statue of Liberty and Ellis Island. It appears today much as it did in its earliest days; it has a museum, and is again called Castle Clinton. Castle Clinton appears in the video game Deus Ex as a terrorist stronghold the player must infiltrate. The Irish music group Wolfe Tones' 1993 album Across the Broad Atlantic contains a tune called "Goodbye Mick" with the farcical line "For the ship will play with pitch and toss – for half a dozen farthings, I'll roll me bundle on me back, and walk to Castle Gardens." Castle Clinton appears internally ravaged near the starting point of the video game Crysis 2 in a post-apocalyptic New York City. Castle Clinton appears in The Magical Battery Park, a 2013 children's book by Linda Anderson Lieberman. Castle Clinton Facts for Kids. Kiddle Encyclopedia.